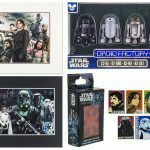 Also, fans of vinyl collectible figures will want to keep an eye out for the new Rogue One Imperial Shoretrooper Vinylmation Eachez Figures. There will be three variants of this figure. For more, check out the original blog post.